Bring pouf flair into your home! 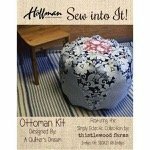 Just For Kicks ottoman kit under the Hoffmans Sew Into It! brand. Each kit makes a large, double-side ottoman measuring about 23″ tall and 23″ wide. Featuring Simply Eclectic screenprint collection by KariAnne Wood of Thistlewood Farm. Pattern by Stephanie Prescott. Bosal Foam Tuffet available for fill. Search Tuffet for product.